Interior painting is an important aspect of transforming a house into a home. But even if your interior painting company uses the perfect paint color on your walls, ceiling, and trim, you may find that something is amiss. If the furnishings, wall art, or shape of the room you want to paint don’t fully complement the interior paint color you like, you may think about remodeling your space, buying new furniture, or even taking things into your own hands with some DIY décor projects. But where should you start? 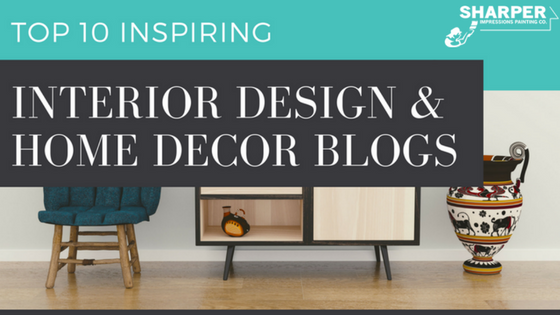 No matter what type of home you have, you are sure to enjoy this all-encompassing interior design and decor blog. It’s packed with photos and interior design ideas for all styles: from modern and traditional, to rustic, vintage and even kids’ room designs, Decoholic has something that everyone can draw inspiration from. Looking for a more affordable way to spruce up your home interior? Bloggers Kathy and Steve can show you how to decorate on a budget without compromising style. Their blog shares interior design basics, helpful DIY interior decor ideas, and so much more. Grace Bonney has run the Design Sponge blog ever since its launch in 2004. Aside from inspirational photos of beautifully-designed home interiors, you’ll find case studies, design tips, and more to help spur ideas for your own home. Diane Henkler’s blog shares plenty of inspiring pictures of interior decor ideas, plus step-by-step tips for transforming any house into a comfortable home. Don’t let the name fool you! Apartment Therapy isn’t just for people who dwell in apartments. This site offers design inspiration for both houses and small spaces. From interior decorating ideas and paint color trends, to home remodeling and organizing, Apartment Therapy is an ideal online stop for anyone looking for home design and decor inspiration. From room makeovers, to DIY projects and seasonal decorating tips, Kris shares something for every interior design enthusiast on her blog. Our favorite part of Driven By Decor is the home tour where you can see before and after images of Kris’ own progress inside her lovely Connecticut cape cod. If you’re a minimalist who likes to keep things simple yet stylish, then you’re going to appreciate Liz Bachman’s blog. Liz is a Denver-based stylist and interior stager who documents her own interior styling and decorating endeavors that inspire other minimalists all over the world. Rayan, founder and editor of The Design Confidential — a DIY + Design shelter blog, studied interior design and also builds furniture. If you’re looking to try your hand at some stellar DIY furniture design projects, this blog is for you. Justina Blakeney is a designer and blogger based in LA. Her blog highlights her passion for the “boho” interior design aesthetic. If you’re looking for breezy, bohemian interior design inspiration, this blog is a must-see. Married bloggers and home improvement gurus, John and Sherry, have nearly 3000 free DIY and home decorating ideas on their blog to inspire your next interior design or decorating project.